Signs are more than just a signaler of where a business is located or what they sell. A business sign can tell a consumer about a business’ products, history, atmosphere and values. Commercial, industrial and residential customers who work with Signs by Van can expect something beyond the typical colorful business sign. Owner Phil VanderKraats and his skilled team work hard to provide something beyond the norm because they understand the ins and outs of not the sign-making business and effective advertising and marketing. This is why a multi-step process and specialized building techniques go into every sign designed by the custom sign-making company. With Signs by Van, clients in different sectors can expect signs that stick out among the crowd and draw the attention of potential customers from the road. The dedicated owner makes sure to use the right tools for every job, whether it be a sandblaster or drill, to craft signs that are a perfect fit for companies and their intended customer base. The sign company specializes in signs for wineries and agricultural businesses but has worked with businesses in different sectors, including s number of restaurants. 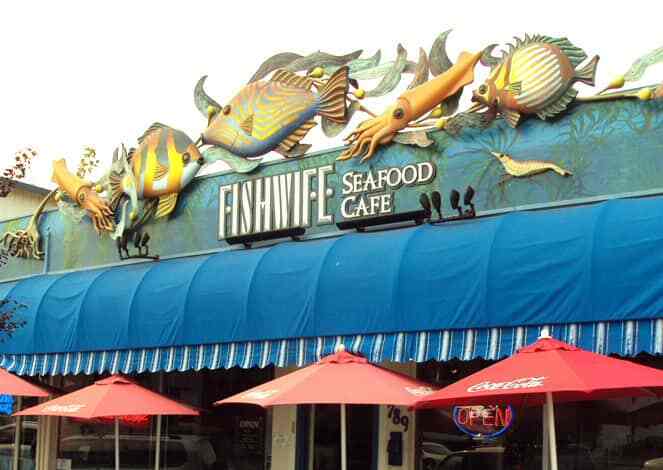 One of Signs by Vans’ most memorable signs has been one done for the Fishwife Seafood Cafe. Using materials such as copper and steel piper, Vanderkraats and his skilled team developed a 30-by-8-foot seascape with prominent, vivid images of kelp and squid. The skilled team for Signs by Van includes a sculptor and graphic designer. When they combine their skills with Vanderkaats’, magic occurs with every project. In everything it does, the team from Signs by Van is committed to the success of its clients. The owner and his employees want to see their clients’ businesses succeed, and they play their part by developing signs that are both eye-catching and stand the test of time. In a rustic barn office surrounded by pines, Vanderkaats comes up with creative approaches for custom-made signs. He draws inspiration from his surroundings and from clients when coming up with ideas for his brand of unconventional signs. The multi-step design process includes planning, budgeting, design, sign creation, city approval and installation. Clients are included in every step of the process, and their input is not only highly valued but at the center of everything Signs by Van does. Vanderkraats has had 33 years in the business and offers guidance to clients throughout every step of the process to ensure that the customized signs not only will meet with their expectations but be the most effective in drawing the eye of new customers. For the owner of Signs by Van and his creative team, developing signs is a craft that they take seriously. With each project, they try to top themselves and create something even more innovative and eye-catching than the last. They have crafted custom-made signs for salons, farms, restaurants, wineries and a variety of other businesses, using carvings, vivid colors, gold leafing, murals or sandblasting work when it fits with the project. The company has incorporated intricately carved roosters, names and dates, hand prints, colorful pirate or orchard designs, horse or turtle images and business logos into designs. Many of the signs are three dimension or incorporate relief work, but each finished product is ultimately different, depending on the client’s business, customers and industry. Customers interested in a custom sign from Signs by Van can visit them in person at 16130 Highway 156, Salinas, CA 93907; call (831) 663-2663 or email sales@signsbyvan.com.